How do you go on a show like Sengkhathele with the aim of dumping your girlfriend but end up being the one being given the boot? Well, that's exactly what happened to Scelo, a 29-year-old guy who planned on bringing his girlfriend and baby mama, Zinzi to the show with the plan to dump her as he was fed up with all the physical & emotional abuse he experienced from Zinzi. Scelo expressed his relationship frustrations and how desperate he was to leave Zinzi, especially because she didn't show him respect. Scelo even shared that at some point, Zinzi climbed on top of him and nearly strangled him to death. He even has the scars on his neck to prove that the altercation occurred. 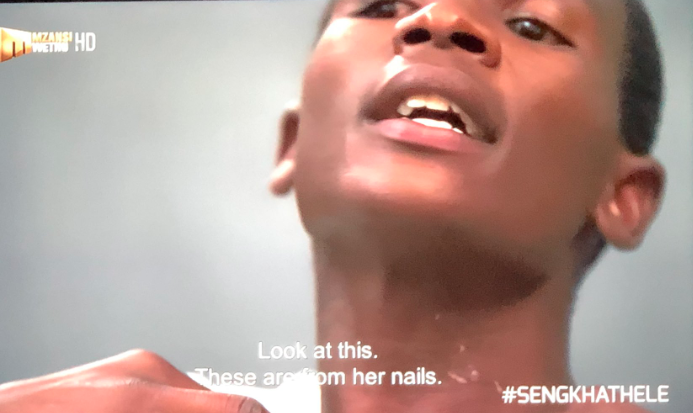 However, Scelo isn't exactly as innocent as he presented himself to be as Zinzi also revealed that Scelo was abusive to her as well, and laid hands on her in front of their kids. As they both shared their grievances about their relationship, it became quite clear that they were very toxic for each other. As soon as Scelo stepped in to speak to Zinzi, she ridiculed him by asking why he came to Sengkhathele looking all dirty. However, Scelo didn't take things laying down and also ridiculed her sense of style by mentioning that she wore curtains for earrings. Their argument began to heat up and if the camera's weren't rolling these two would've probably physically caused harm to each other. While the argument was ongoing, the tables turned when Scelo was suddenly the one getting dumped. A switch up that confused a lot of viewers. Things were so bad she even returned the watch he purchased for her as she didn't want it anymore. Before the show ended it was quite evident that these two were toxic for each other and the best thing that they could've done is to just end the relationship as it could've easily ended badly. The ex-couple will still co-parent their two kids together regardless of the fact that they do not like each other. What were your thoughts of the final episode?